Several days ago, the Carnival Triumph, operated by Carnival Cruise Lines, became inoperative after a fire broke out in one of the engine rooms. On board, 3,143 passengers and 1,086 crew members are stranded with limited food, no air conditioning, only a few working toilets. According to a CNN report, passengers who are now enduring their third day adrift at sea are commonly seeing “sewage running down the walls and floors.” Carnival has asked all people on board to defecate in bags and urinate in showers. If hungry, passengers have to mustard waiting in line for over three and half hours to eat cold meals. Due to the lack of air conditioning and gaining bad smells throughout the ship, more and more people are sleeping out on the decks. This latest event on a Carnival cruise ship should not come as a surprise. Back on November 8, 2010, the Carnival Splendor endured the same fate. A 7-day cruise to Mexico turned nightmarish for its 3,299 passengers and 1,167 crew members after a fire broke out in the engine room. The ship was approximately 150 miles south of San Diego, CA. It took hours for Carnival crew members to extinguish the fire, and several people were injured in the panic. Much like passengers aboard the Carnival Triumph are experiencing now, passengers of the Carnival Splendor had very little to eat for days, and suffered through 96 hours of extremely poor hygienic conditions. Several months after the Splendor fire, it was finally determined that the fire emerged from the aft engine room, and that second engine room of the ship failed to start, which should have allowed to maintain power throughout the ship. 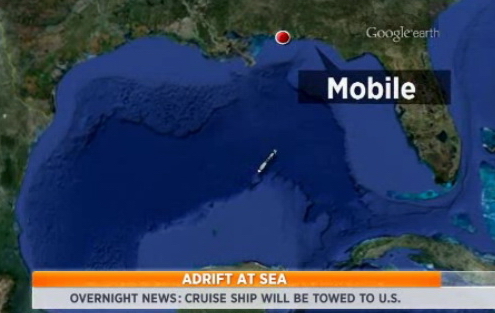 The Carnival Triumph is scheduled to be towed back to the United States and arrive in Mobile, AL on Thursday. 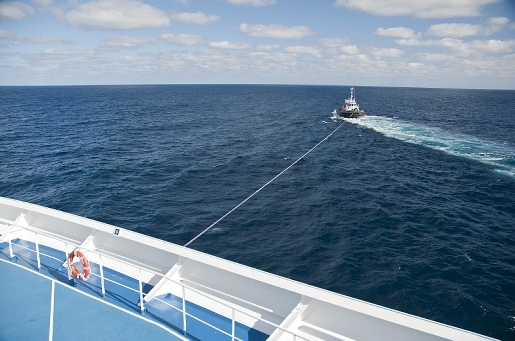 The Carnival Splendor was also towed by a tug boat, back to San Diego, CA. Carnival so far is reporting that all passengers are safe and no injuries were sustained as a result of the fire. Carnival’s statement is eerily similar to the statement made in the aftermath of the Carnival Splendor fire, yet it was inaccurate. Carnival Cruise, like any other cruise line, is held to the same standard of providing a safe environment for its passengers at all times, whether an emergency occurs during the cruise or not. Could stranded passengers hold Carnival accountable for this preventable mess? The answer is probably not. the fire aboard the Splendor gave Carnival the opportunity to find out what to do if such circumstances were to happen again. Carnival has jumped in front of the problem this time around. Carnival will refund all passengers aboard the Triumph, and will refund the cruise tickets of all passengers scheduled to sail aboard the Triumph for weeks to come. Accepting a refund does not waive a passenger’s rights to file a lawsuit against Carnival, but it certainly hinders the perception that passengers were not taken care of by the cruise line. Secondly, and most importantly, the emergency aboard the Triumph does not change the existing thresholds in order to sue any cruise line. For one, a passenger will have to show that they have sustained a personal injury. Without provable and legitimate damages, a lawsuit will be dismissed within weeks of being filed. Second, even if a passenger sustains legitimate injuries, they must prove that their injuries were caused by Carnival’s negligence. Alleging that passengers have a claim for damages against the cruise line simply because their cruise/vacation were ruined by the fire is not enough. If you would like to discuss your specific situation as it relates to injuries sustained while on a cruise ship or on a cruise excursion, contact one of our maritime attorneys immediately at 305-854-4900, or 800-836-6400.